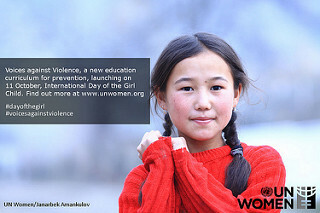 I found out that today is International Day of the Girl Child. My first reaction, inevitably influenced by my self-identification as a woman and former girl, was to wonder why I hadn’t heard of this day before and why it wasn’t more of a big deal in Ontario. So, rather than complain about it, I thought it was better that I learn about it and spread the word. This year, the UN’s slogan for the day is Girls’ Progress equals Goals’ Progress: What Counts for Girls which is based on its 17 Sustainable Development Goals. The emphasis of the slogan seems to be two-fold: 1- Recognizing that an investment in girls is an investment in the world; 2 – There is a need for data collection and analysis about girls that will inform next steps and progress. That’s a very simplistic explanation – I highly recommend reading or at least perusing UNICEF’s well-written key messages – the information is powerful. Every authentic effort counts. Do something today and then continue to do something because this is about sustainability and incremental change. And, in case you’re still not convinced, here’s a video from UNICEF to energize you.